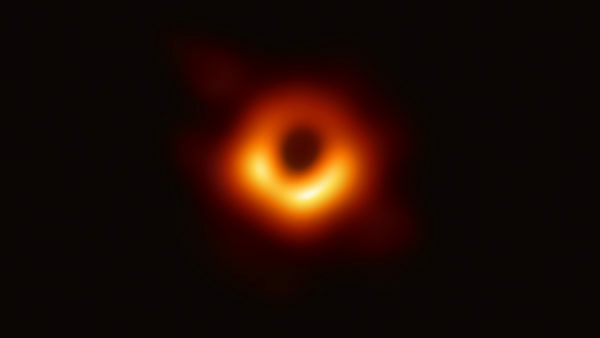 Home Tags Posts tagged with "messier 87"
The first ever photograph of a black hole has been revealed by scientists on April 11, 2019. Until now we have only ever been able to imagine what a black hole might look like, but now scientists from all over the world have worked together to take the first ever picture of one. Eight observatories from all over the world linked together back in 2017 to form one giant virtual telescope called the Event Horizon Telescope (or EHT for short). The EHT has captured an image of a ‘monster’ black hole, which sits around 54 million light years away from Earth, in a different galaxy called Messier 87. The black hole is three million times the size of the Earth, and spews out a hot jet stream of particles that stretches for 5,000 light years. A black hole is a dying star that has collapsed inward under the pressure of its own weight. The pull of gravity from its centre becomes so strong that even light can’t escape, which is why it looks black. It essentially becomes a super massive ‘vacuum’ sucking in stars, planets or anything that gets too close – a bit like when you pull the plug in the bath. Black holes are also invisible, technically speaking, which has meant it has been very tricky for scientists to capture them on camera. As things get sucked into the black hole the radiation energy bursts out from behind it, which the EHT team have used to help them take a picture, and is the reason why it looks a bit like a silhouette. Most galaxies are thought to have a supermassive black hole at their centre.